What conditions does Feldene treat? Tell your doctor right away if you have any serious side effects, including: easy bruising/bleeding, difficult/painful swallowing, hearing changes (such as ringing in the ears), mental/mood changes, swelling of the ankles/feet/hands, sudden/unexplained weight gain, signs of kidney problems (such as change in the amount of urine), unexplained stiff neck, vision changes, unusual tiredness. List Feldene side effects by likelihood and severity. What should I know regarding pregnancy, nursing and administering Feldene to children or the elderly? Products that may interact with this drug include: aliskiren, ACE inhibitors (such as captopril, lisinopril), angiotensin II receptor blockers (such as losartan, valsartan), cidofovir, corticosteroids (such as prednisone), lithium, "water pills" (diuretics such as furosemide). Does Feldene interact with other medications? If you are taking this drug on a regular schedule (not just "as needed") and you miss a dose, take it as soon as you remember. If it is near the time of the next dose, skip themissed dose and resume your usual dosing schedule. Do not double the dose to catch up. 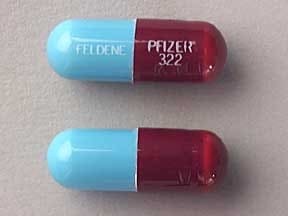 This medicine is a maroon blue, oblong, capsule imprinted with "FELDENE" and "PFIZER 322". 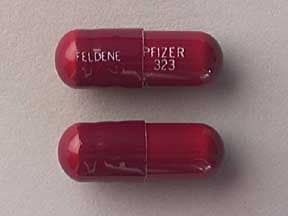 This medicine is a maroon, oblong, capsule imprinted with "FELDENE" and "PFIZER 323". Are you considering switching to Feldene? How long have you been taking Feldene?